Bhel is my favorite chat. It is light, tasty. 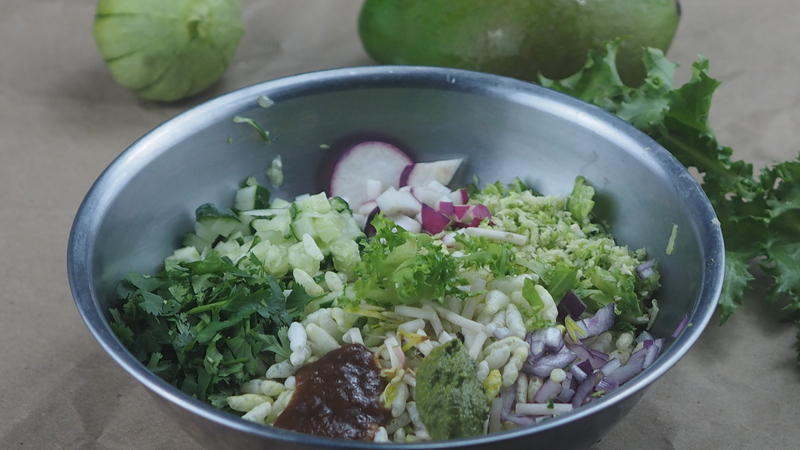 Traditionally it is made of puffed rice mixed in tamarind chutney, green chutney, onion, tomatoes and cilantro. Though onion, tomatoes are usually used, it can be made out of many combinations. 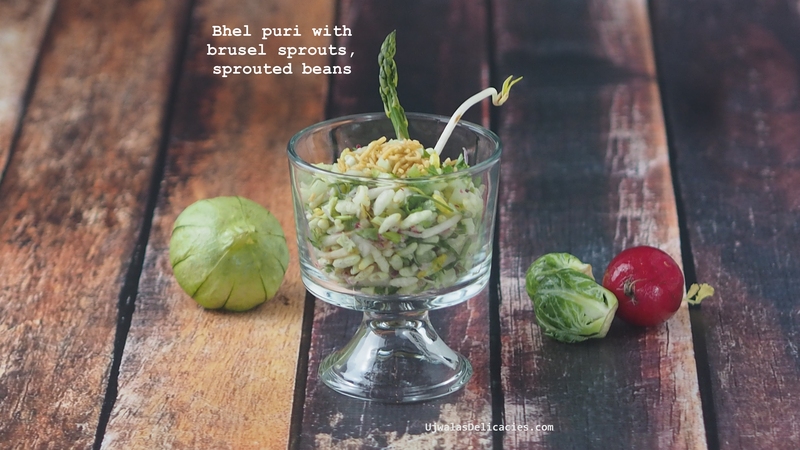 Crunchy vegetables go excellent with Bhel. Combinations as a sour vegetable like tomato, neutral as cucumber, earthy as sprouted beans and a garnish. I remember having street-side Bhel in my college days. Golden days. It is served in cones made of paper and another small card board to eat. Ya now it sounds different, but I don’t mind. The taste, experience is priceless. Even now when I visit India, I don’t miss a chance. There are many bits and pieces in Bhel recipe. Some of you may be overwhelmed by number of items. But it’s not time-consuming. Chutneys stay fresh in refrigerator for least of 7-10 days. Chutneys can be reused for many dishes over these days. If you plan that way, you will save a lot of time over next few days. Follow my blog for more recipes. I make chutneys first. Soak tamarind first. Then roast peanuts or sesame seeds depending on my choice. While I have my sweet chutney on stove, I grind green chutney. Wala!!! 80% of work is done. Roasting puffed rice in cumin and turmeric is optional. Roasting adds up flavor and crunchiness. On top of it, using crunchy vegetables decreases necessity of store-bought mixture. Though initially I thought of adding sprouted beans and brussel sprouts, I ended up adding radish, tomatillo sprinkled with sev. Add and heat oil to pan. Add 1 tbsp cumin, ⅛th tsp turmeric powder. Add puffed rice to this. Mix well and roast for 10 minutes. Stir every 1 minute. Soak tamarind for 15 mins. If using raw mango, steam in pressure cooker for 2 whistles or till soft in a pan. While it soaks, roast peanuts or sesame seeds till golden brown. In a grinder, grind dates with little water. Squeeze tamarind for extract. If using raw mango, squeeze steamed mango for extract. Add tamarind extract and dates mixture to a saucepan. Let it boil for 10 minutes. Don't let it become thick. If it becomes thick, you can't mix properly in bhel. Keep it semisolid consistency. Add water if you need to. At end, add salt. If making with raw mango, follow same procedure. Now add all green chutney to blender, grind till smooth. Cut onions, tomatillos, sprouted beans and cucumbers to small cubes. Add puffed rice to mixing bowl. 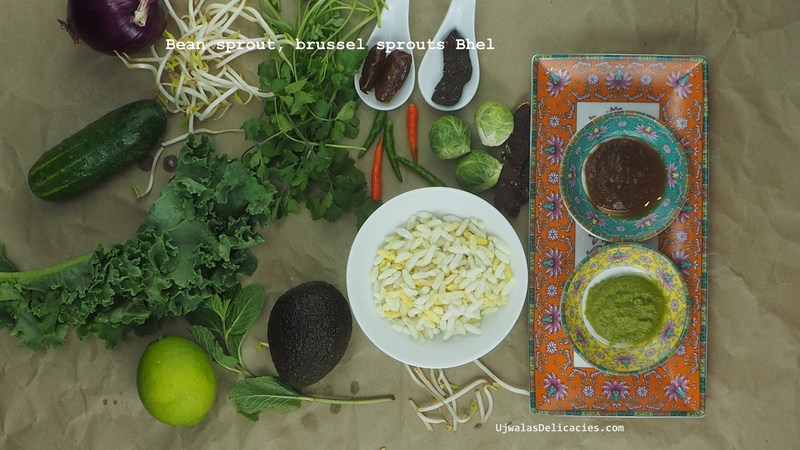 Add grated brussel sprouts, radish, cilantro, 1 tbsp green chutney and 1 tbsp tamarind chutney. There are no exact measurements for chutneys. Adjust according to your taste. I like my bhel spicy so I add more green chutney. I add more tamarind chutney for who like sweeter taste. Sprinkle sev and spicy mixture on top. Serve immediately before it is soggy. Chutneys make puffed rice soggy very soon. Eat while it is crunchy.